Before we can get into the practical administration of ZFS datasets, we need to understand exactly how ZFS is storing our data. So, this post will be theoretical, and cover a couple concepts that you will want to understand. Namely the the Merkle tree and copy-on-write. I'll try and keep it at a higher level that is easier to understand, without getting into C code system calls and memory allocations. The reason we cryptographically hash each block, is to ensure data integrity. If the block intentionally changes, then its SHA-256 hash should also change. If the the block was corrupted, then the hash would not change. Thus, we can cryptographically hash the block with the SHA-256 algorithm, and check to see if it matches its parent hash block. If it does, then we can be certain with a high degree of probability that the block was not corrupted. However, if the hash does not match, then under the same premise, the block is likely corrupted. This uber block is responsible for verifying the integrity of the entire Merkle tree. If a data block changes, all the parent hash blocks should change as well, including the uber block. If at any point, a hash does not match its corresponding children, we have inconsistencies in the tree or data corruption. ZFS uses a Merkle tree to verify the integrity of the entire filesystem and all of the data stored in it. When you scrub your storage pool, ZFS is verifying every SHA-256 hash in the Merkle tree to make sure there is no corrupted data. If there is redundancy in the storage pool, and a corrupted data block is found, ZFS will look elsewhere in the pool for a good data block at the same location by using these hashes. If one is found, it will use that block to fix the corrupted one, then reverify the SHA-256 hash in the Merkle tree. Copy-on-write (COW) is a data storage technique in which you make a copy of the data block that is going to be modified, rather than modify the data block directly. You then update your pointers to look at the new block location, rather than the old. You also free up the old block, so it can be available to the application. Thus, you don't use any more disk space than if you were to modify the original block. However, you do severely fragment the underlying data. But, the COW model of data storage opens up new features for our data that were previously either impossible or very difficult to implement. The biggest feature of COW is taking snapshots of your data. Because we've made a copy of the block elsewhere on the filesystem, the old block still remains, even though it's been marked as free by the filesystem. With COW, the filesystem is working its way slowly to the end of the disk. It may take a long time before the old freed up blocks are rewritten to. If a snapshot has been taken, it's treated as a first class filesystem. If a block gets overwritten after it has been snapshotted, it gets copied to the snapshot filesystem. This is possible, because the snapshot is a copy of the hash tree at that exact moment. As such, snapshots are super cheap, and unless the snapshotted blocks are overwritten, they take up barely any space. 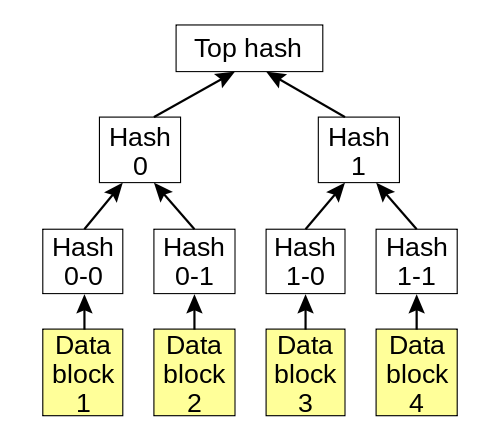 In the following image, when a data block is updated, the hash tree must also be updated. All hashes starting with the child block, and all its parent nodes must be updated with the new hash. The yellow blocks are a copy of the data, elsewhere on the filesystem, and the parent hash nodes are updated to point to the new block locations. 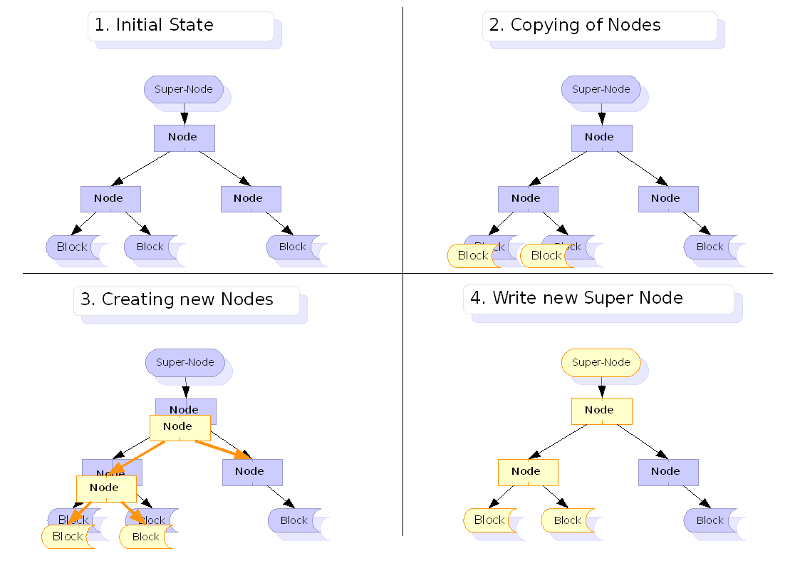 Image showing the COW model when a data block is created, and the hash tree is updated. Courtesy of dest-unreachable.net. As mentioned, COW heavily fragments the disk. This can have massive performance impacts. So, some work needs to be taken to allocate blocks in advance to minimize fragmentation. There are two basic approaches: using a b-tree to pre-allocate extents, or using a slab approach, marking slabs of disk for the copy. ZFS uses the slab approach, where Btrfs uses the b-tree approach. Normally, filesystems write data in 4 KB blocks. ZFS writes data in 128 KB blocks. This minimizes the fragmentation by an order of 32. Second, the slab allocater will allocate a slab, then chop up the slab into 128 KB blocks. Thirdly, ZFS delays syncing data to disk every 5 seconds. All data remaining is flushed after 30 seconds. That makes a lot of data flushed to disk at once, in the slab. As a result, this highly increases the probability that similar data will be in the same slab. So, in practice, even though COW is fragmenting the filesystem, there are a few things we can do to greatly minimize that fragmentation. Not only does ZFS use the COW model, so does Btrfs, NILFS, WAFL and the new Microsoft filesystem ReFS. Many virtualization technologies use COW for storing VM images, such as Qemu. COW filesystems are the future of data storage. We'll discuss snapshots in much more intimate detail at a later post, and how the COW model plays into that. Posted by Aaron Toponce on Friday, December 14, 2012, at 6:00 am. Filed under Debian, Linux, Ubuntu, ZFS. Follow any responses to this post with its comments RSS feed. You can post a comment or trackback from your blog. For IM, Email or Microblogs, here is the Shortlink. Awesome series, Aaron! Thanks for all the work you put into it! My question is: When you scrub your storage pool and there is NO redundancy in the storage pool, what happens next? If you have a block that does not hash to the stored SHA-256 digest, and you do not have redundancy, then you may have a corrupted file, and you will need to restore it from backup. [WORDPRESS HASHCASH] The comment's server IP (216.105.40.114) doesn't match the comment's URL host IP (216.105.40.123) and so is spam.